Click for larger picture. Atlantic coast of St. Lucia as seen for the northern point of the island. We booked a taxi tour of the north of the island. This is a great way to see things. You pay an hourly flat rate and you have the driver at your service for the number of hours you agreed upon. The resort’s tour specialist found us an appropriate driver. I cannot recommend Cherry Taxi Service out of Choc Castries enough (also stationed at the Almond Morgan Bay). Isaac is a fantastic guide. He treated us to one of the most unique tours I’ve ever been on. 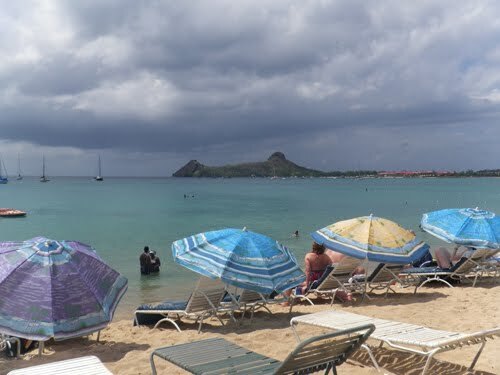 Rodney Bay. 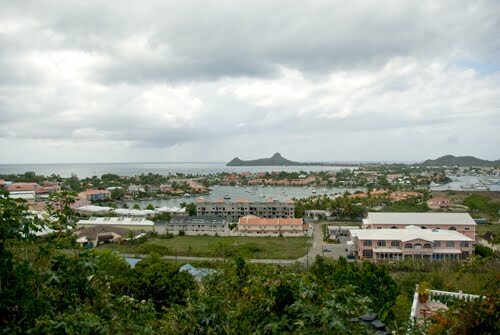 The two peaks in the background are part of Pigeon Island National Park. 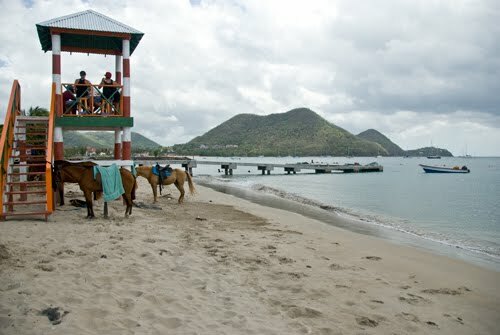 We started out by visiting Rodney Bay and the public beach there. It looks out at Pigeon Island National Park. We drove around to various lookout points getting photos of good views. Then we drove to the entrance of Pigeon Island National Park. 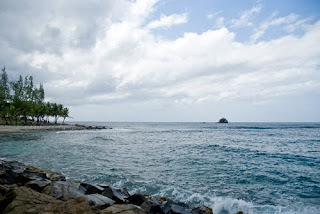 Here is where the Atlantic Ocean and Caribbean Sea meet. It’s a dramatic meeting. 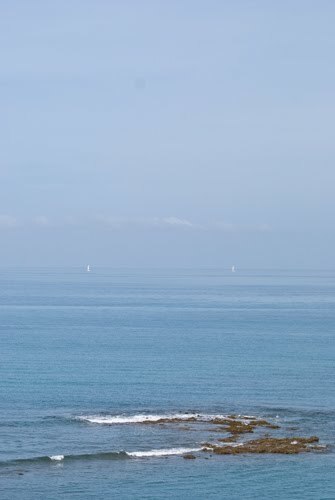 The Atlantic showing its wild and woolly self, typically rough around the edges and the Caribbean calm as calm could be. You can see the line where they meet. It’s rather dramatic. Where the Atlantic and Caribbean meet. The transition happens right at the point that is sticking out on the left. You can kind of see the Atlantic's surf and the no surf at all beyond the point. They have horse parking on the beach. As we drove around we saw horses on the beach, mongrel island ponies, some lining the road with foals nursing. Cows and goats were also numerous as are chickens. Livestock is welcome to wander where it may, especially goats and chickens, though I did see a group of cows happily sauntering across a construction site. You can see roosters and chickens just about anywhere. Why there aren’t squished chickens or recently hatched chicks lining the roads is a mystery to me. They seem to be very good at dodging into the gutter just as the wheels come by. These St. Lucian chickens have really good timing. 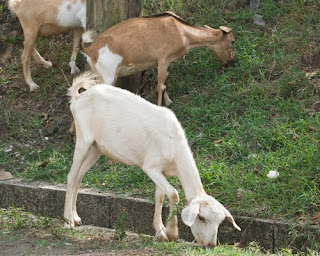 There are goats all over the residential areas of St. Lucia. Interestingly enough though, the only goats Isaac stopped for so that I could take a photo, though he knew I wanted a photo of the goats, were goats owned by a good friend of his. So here are Isaac's good friend's goats. 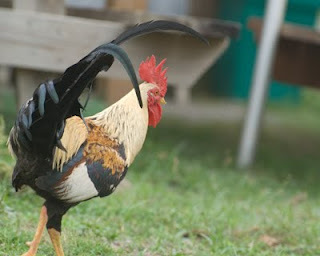 St. Lucian rooster. Coloring is typical of the local breed. 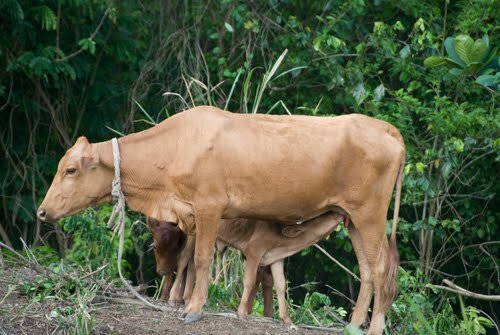 Most of the cows were this light chestnut color. This one had twins. One nursing and one peaking out under her neck. Isaac has a good eye. 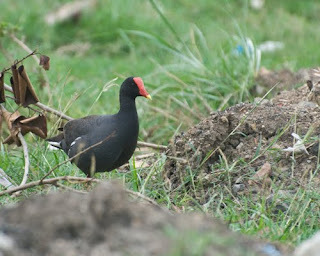 He found this moorhen for me near a tiny trickle of stream between two houses. They call it a "water bird." 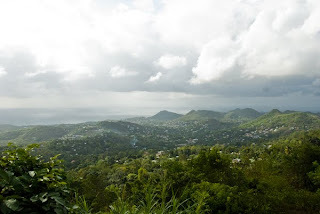 The best part of our tour was the drive up through the heights of Choc Castries. Isaac taught us all about the medicinal plants, fruit trees, and important plants of the area. He even waved down random people walking along the side of the road to go pick fruit for us to try, out of peoples’ front yards mind you. This was a lot of fun. We ended up trying tamarinds, raw lentils, cherries, and “coconut jelly.” I’m not sure if it’s the type of coconut but instead of being hard and white inside these coconuts had a gelatinous lining that Isaac scraped out the shell for us to eat. 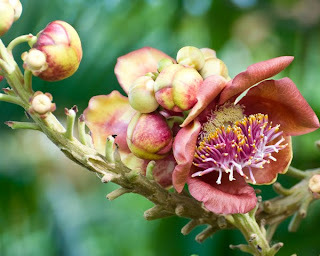 We also examined star fruit (called “five fingered fruit” in St. Lucia). We saw all kinds of fruit trees. I looked longingly at the many unripe mangoes we passed. 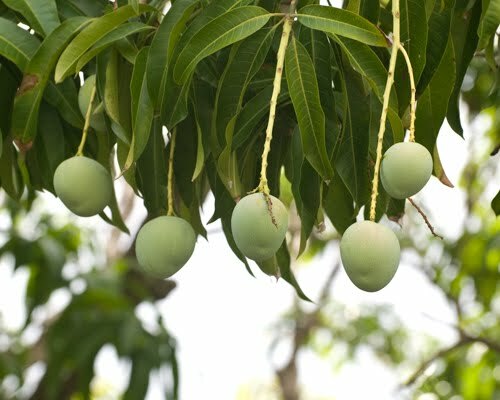 A few weeks later and we could have had a feast consisting of at least five different types of mangoes. 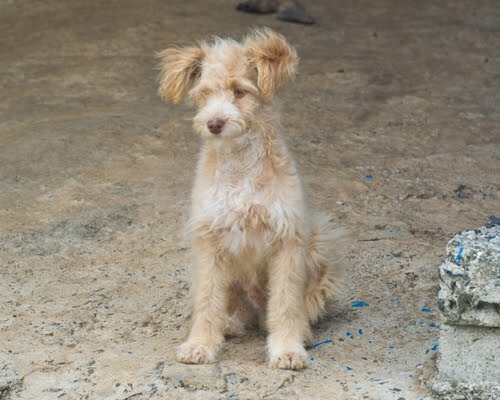 The world's cutest puppy. I just love his/her ears. 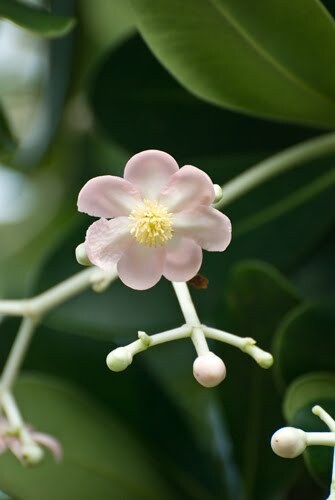 We also learned about the leaves of the soursop tree. The fruit is delicious we were told but the leaves are used to make a tea that helps children sleep. 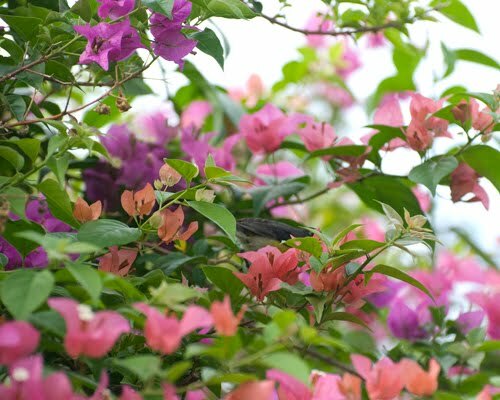 Another important tree is the “Spice Tree.” The bark is used to spice rum and also to make tea. 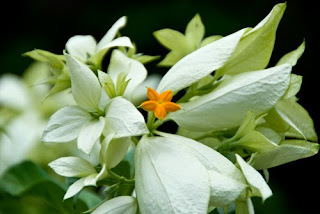 It is reportedly a powerful aphrodisiac. My favorite moment of the entire tour was seeing the look on Traveler Five’s face when Isaac took a rather large knife out of the back of the taxi. He used this to harvest the bark of the spice tree in someone’s front yard. I assume he knew the person seeing as it turned out we were driving around the neighborhood where Isaac and his father live. The bark smells like cinnamon, citrus, and vanilla. Isaac has good timing too. We said a three hour tour and he dropped us off at exactly three hours almost to the second. The best taxi tour ever. 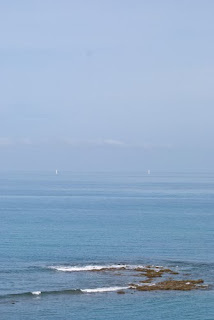 The sky disappearing into the sea. 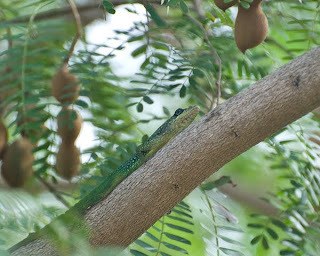 Tree lizard in a tamarind tree. 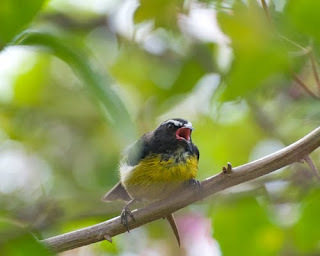 Bananaquit doing what it does: making noise. 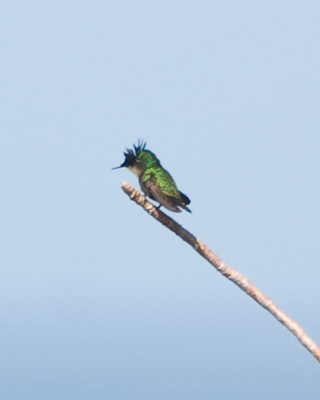 Bad photo of one of the three endemic hummingbird species: a Antillean Crested Hummingbird. 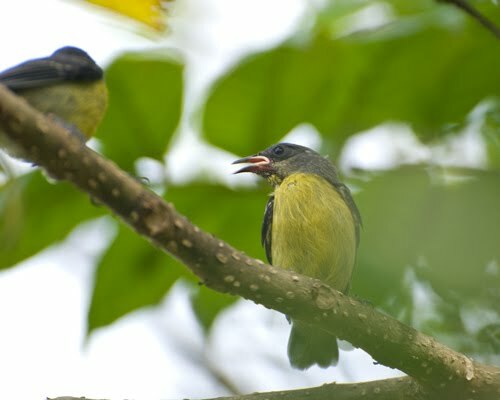 The other two, which I did see, are the Green-Throated Carib and the Purple-throated Carib.